I must warn you first and foremost, this post is not pretty. In fact, it pains me to even post these pics because now you're going to KNOW what has been lurking in my house all these years! What is it that I'm talking about? Well.................it's this. Gosh, isn't it hard to look at??????!!!!!!! I feel like someone that just had to admit that they're an addict or something before a lot of people and now they're ALL in judgement of me. LOL! This is my oldest son's room. And why am I sharing it with you now? Well, it's because we are FINALLY redoing his room. It has been neglected much too long. He is away at Marines boot camp right now so we decided it was the perfect time to get started on it. So, please go take an aspirin or something that will help you digest these unsightly "before" pics that I'm sharing with you now. Notice what a pack rat he is! 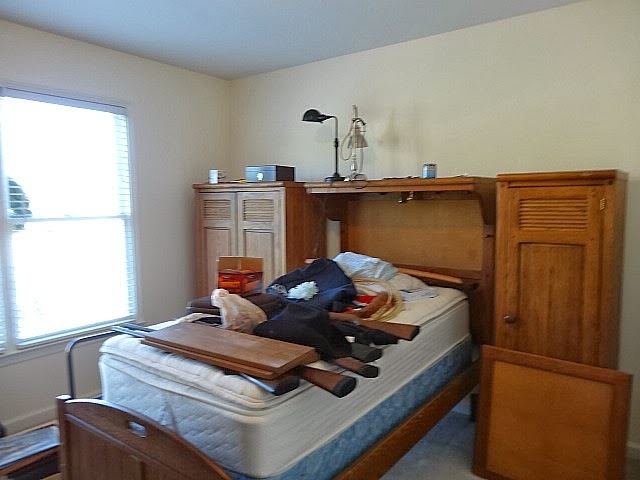 This is after I picked up all the clothes on his floor and stripped his bed and moved a big ugly blue sofa out that left an even uglier blue mark on the wall and all the way out the front door where it will soon reside in a big ugly dump (where it belongs)! Can you tell I hated that sofa? Whew! Now that the ugliest part of these photos are over, here are the "progress" pictures. The first order of business was to paint over the light blue walls which included patching the hundreds of thousands of holes that my son made by hanging crap things on them. We painted the walls in BM Linen White. I had to repaint all of the trim and closet doors too! It was THAT bad. Now, things are starting to look a little bit better since I'm painting all of his furniture in BM Chelsea Gray. I like the look of painted furniture and he had ruined this furniture with scratches etc. So, I had no choice but to paint it really. It was once in perfect condition if you can believe it. This is the bedding that I've ordered from H&M. I think it will look nice with the other colors in the room. I plan on introducing some burlap in his room as well. So................I have faith that his room is going to turn out great! We hope that he is getting more organized and disciplined in boot camp so that when he comes home, he will KEEP his room clean! I am still working on his room as I write this, so the full room reveal will have to wait. I hope to have it done very soon though! Anyone want to come over and help me finish painting??? His room is coming along nicely!!! I love the paint colors you have picked and the bedding you have chosen is great too!!! I Can't wait to see it all finished and I bet your son is going to be shocked!?!?! LOL!!! It is going to look great when it is done! I love the color you chose for the furniture and the bedding is going to go so nicely with it! That's too funny about not watermarking these photos! LOL! Anyway, his room is going to look great! I can't believe what a difference the paint makes on the furniture. You picked a great paint color and the bedding is just perfect. No judging from me Kelly.I think most kids bedrooms look like this,that's why we have doors :-) .So glad we can shut them when we don't want to look at it LOL! LOVE the color choices and fabric too! It's going to look fab when you are done! I can't believe you are getting a jump on your decorating during the holidays. I am making a list of everything that needs to be done, but no projects until after Christmas. I love the shade of gray you are using for the furniture. Have fun with your redo. 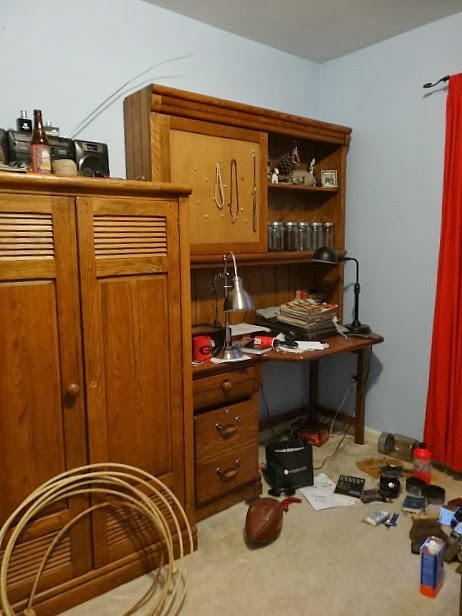 Anyone who has survived a teenage son recognizes that room....I HOPE he will keep it clean....Hope being the operative word here!!! That room is going to look great. I keep hearing people talking about the H&M Store, so finally I had to look it up. Is it correct that there are no H&M stores in the US? Is it an online store only? Merry Christmas! Oh, I love the choices and can't wait to see it all finished! 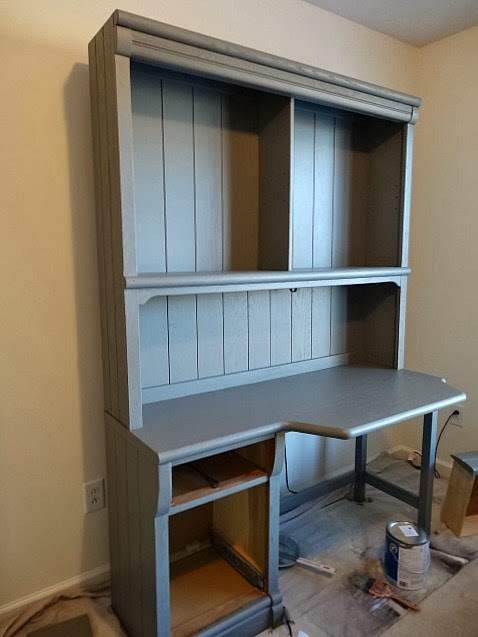 I love the painted desk! I can't wait to see the finished room. 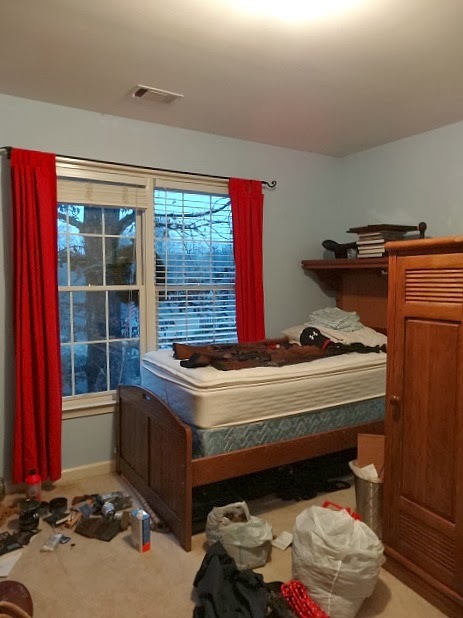 Your son's "new" room is looking great, and I can't wait to see how it looks finished. Great colors. I'm going to redo my son's room too... he still has all his team pictures up starting from the 2nd grade thur last year... talk about nailholes. I'll be following along!! The color choices are fantastic. It will look great once finished. 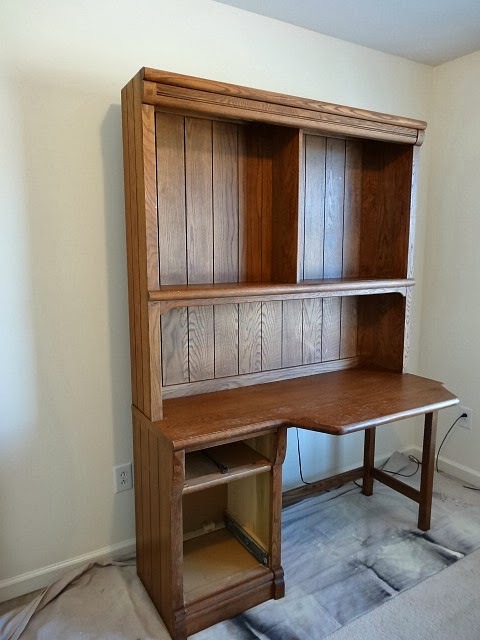 This room is going to look awesome from what your sharing already! Can't wait to see it finished! Great choices! It will look great when finished. Looking real good Kelly...can't wait to see it all finished! Love the bedding you chose! I love the progress already. WOW! It is looking so much better. I cannot wait to see the changes. I have the female counterpart to that room upstairs. It is purple and white and has her clothes all over the walk in closet and floor while she is in Korea. It is horrid so I know of what you speak. Your son's room looks better already. I am not touching hers. He likely will be neater when he gets home. We can hope anyway. I can tell you though that I helped raise my younger sister and she was awful like my CC, clothes on the floor and such but now in her thirties she is an excellent homemaker. She cleans her baseboards all the time. I don't do that. Not often anyway. Oh I can already see so much potential!!! Love the wall color and the color you chose for the furniture!! 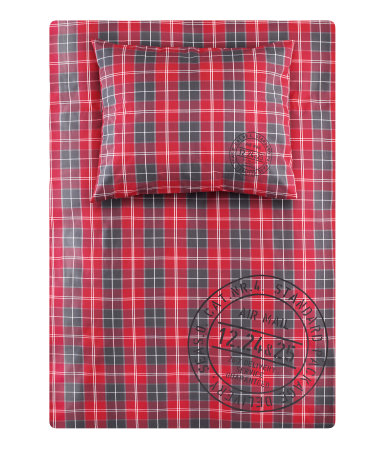 Did not know H&M carried bedding..love the plaid! your son's room looked great compared to how my son's old room was last year when I finally cleaned it up to paint it and update it to the 2nd guest room...now it seems i might get that headboard finished in 2014(!) and do a gallery wall and finally post it...fingers crossed! that furniture looks fabulous painted! I'm looking forward to see all the special touches you put to it! Ha Ha Kelly you crack me up!!!! 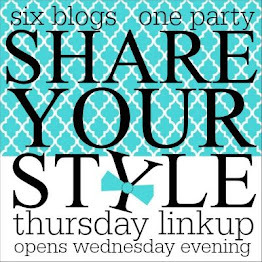 You never know in pinterest world who may want to pin!!! This room is going to be so great. Your son will have a special new room to come home too in January after he graduates from boot camp. I love that bedding just gorgeous. I cannot wait to see the whole reveal. I remember well what a teenager can do to destroy their bedroom! They call it decorating. hehe I can already see how fabulous his room is going to look when you finish your painting. I love the bedding you chose, too! Can't wait to see it finished! I do imagine in boot camp he will learn even how to make his bed! That's in case he never has. Yes, it is already looking better. Omgoodness! I have my son's practice lariat, (that he aquirred at college in Texas), stored with our outside Christmas wreath! I laugh everytime I see it! A must keep should he wish to rustle up some cattle one day! I am loving it!! I was not surprised as I continued down your post to see you had painted the furniture!!! You are my inspiration!!! I have said that many times! I plan to paint the furniture in my guest room and transform it from an old lady's room to FRESH!! A room for guest - perhaps FOUR at a time!! As in the quads!!! Merry Christmas, Honey! YOU are amazing!!! Oh yes, it looking fabulous. The furniture is perfect grey...love it, and the walls. The bedding is perfect. Can't wait for the finale. You are amazing...I will say AMEN to that too. WOW, it's going to be pretty awesome when done! LOL..I seriously laughed out loud when you said you felt like an addict admitting something. No judgement here. I have not shown Alex's room in over two years, hence there is a reason. Merry Christmas Kelly and family! Love the color you are painting the furniture. Can't wait to see more. Oh, I am so happy for you. Hopefully you can reclaim the room, a little. Seriously, if young adult males live in a home that's what it tends to look like. No worries in sharing. My son's room looks like a bomb went off and company is coming in two days. Hi Kelly, Right now I've got a couple of attic storage areas that look like a bomb went off in them! Thank God for doors, lol. I love where you're going with the changes and look forward to seeing your addition of burlap. Happy Holidays! 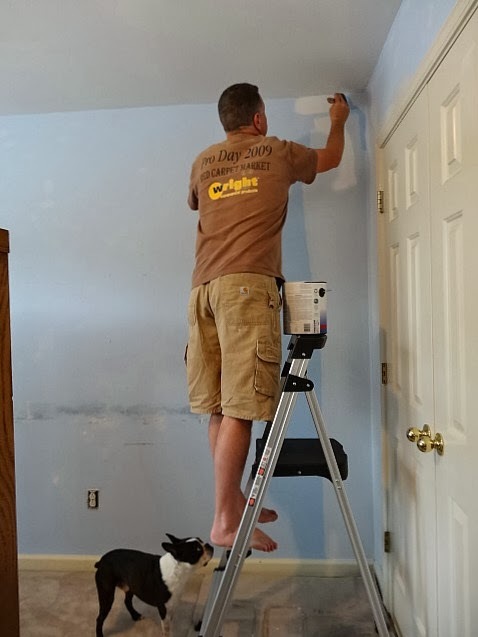 Not a fan of painting furniture (as you may know) but I love that color..You're probably having a great time redoing his room..It's going to look fantastic.. This is going to look great! Please tell me -- what is H & M? I have seen this reference before. I can tell your son's room is gonna look fantastic! I have a room just like it! It's my son's room! We just "re-did" it, but I had to give up some control and let him do certain things the way he wants to, so I can't say I really like it. I haven't posted it yet, because it means I will have to pick up everything off the floor and straighten things up. It's way too much work! Anyway, I like the changes you are making and can't wait to see the total reveal! He is going to come home and thank you for tackling his room. He will love the order and discipline of it all, but mostly he will love that it feel like home. Kelly, this looks great! Love the color choices! I'm sure the room will be wonderful when you are done! His room is going to look so fresh and the colours you chose are great. I have teens and lots of nieces and nephews so I know how their rooms can get cluttered. Wishing you and your loved ones a very Merry Christmas, happy holidays and all the best in the New Year.